While The Blood Gospel was a problematic read for me, one with which I wasn't entirely comfortable, I enjoyed the adventure aspects of it enough to give the second volume a chance. All I asked was that the issue of faith be better explored, that Erin's character develop the way I felt it should, and that the villains come out of the shadows. Unfortunately, Innocent Blood (The Order of the Sanguines #2) failed to deliver for me on all accounts. I hate to say it, but as much as I have enjoyed some of James Rollins solo efforts, I think I'm done with this series. What originally drew me to the series was its take on vampires. I'm a huge fan of dark, sinister, old-fashioned, monstrous vampires, so I was really curious to see what he and Rebecca Cantrell would do with the mythology. The whole idea of the strigoi (damned and fallen) versus the Sanguine (saved and redeemed) is an interesting one, but I didn't feel they did anything to develop it further here. If anything, they erased some of the grey areas that I felt made the concept so interesting. The first book teased us with a question as to whether consecrated wine really has magical/miraculous properties, or whether graduating strigoi into Sanguine was all a matter of faith, but it shied away from providing an answer. Here, we see the power of consecrated wine, and the consequences of would-be Sanguinists being found unworthy. Not without faith, mind you, but unworthy. Clearly, despite the novel's early tease (in which a Crusader if he is so certain there is only one God), the authors come down hard on the side of Christian certainty. As for the characters, I was really disappointed in the way Erin's character was developed here. I felt she was robbed of much of her objectivity and inquisitiveness, becoming little more than a romantic entanglement. Similarly, Jordan fell very much into the stock hero mold, and what I originally thought to be a game-changing act of sacrifice turned into nothing more than an excuse to have him jump the proverbial religious shark. Rasputin was one of the most interesting characters introduced in The Blood Gospel, and I was curious to see how he'd be developed here, but I found his potential to be largely wasted. By contrast, I really loved what they did with the introduction of Elizabeth Bathory, especially the complexities of her relationship with Rhun. 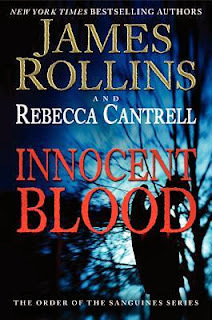 I kept waiting for her to be cleansed and redeemed, to fall into the fold, but Rollins and Cantrell allow her to remain true to her past and to her self. It was probably her, more than anybody else, who kept me reading. While the presence of Judas in the series pushed the story a bit too far into Christian territory for me, he presented some interesting dilemmas, and prompted some interesting questions. I quite liked the way he was explored, the influence he had on the other characters, and the justifications he presented for his actions. As willing as I was to accept his role, though, the story lost me completely when it started dealing with angels. It was at that point that I started skimming, looking ahead, and waiting for an end, as opposed to anticipating it. Overall, Innocent Blood started out slow, with very little of consequence happening early on. There was some absolute carnage at the halfway point that got me interested, with what seemed to be some legitimate stakes involved, but the potential was just as quickly erased. What we're left with is a religious thriller that becomes more tedious than tantalizing. It will probably appeal very much to the right audience, but I'm convinced now that audience simply doesn't include me.